It is starting to look like fall as we wrap up the dark blue month. Even though I could work for a lot longer and not be out of blue, it will be nice to shift to a new color on Monday. I hope you have all been able to make a dent. the linky tool is below. There is just one more blue Saturday after today. I hope you are all making a dent. Blue seems to be the color that just keeps giving. Every time I did into my blue bin I am surprised at how much is there. I spent last weekend digging in to find dark blues to turn into hexies. After there were plenty of those, I moved onto the teal blue to make sure there were plenty to spare. I'll be taking these with me to a working trip to Jacksonville next week to work on state test editing. Plenty of hand work should keep me busy in the evenings. Just back from 5 miles on the beach. I am sandy and sweaty and wet. Off to shower and will check back in soon. Hopefully you are all finding sewing time these days. I keep thinking that things will slow down soon. Someday it will I'm sure. I'm off for a run this morning. 10 miles, but I'll check back in. Hopefully everyone is getting a start on blue. Blue is one of those colors that just keeps going on and on. I'm happy to have two months to try to make a dent. I think it is a soothing color. Maybe its the sky? It could be about the ocean. In any case. I'm glad to have another chance to make a dent in the blue bin of scraps. 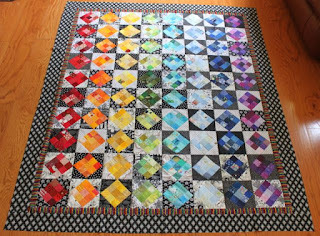 Welcome to the quilters meet and greet. 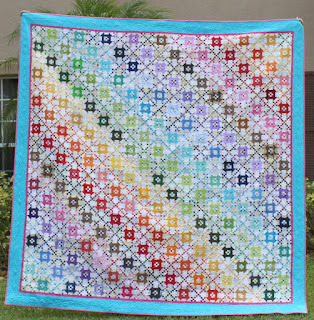 Hi, I'm Angela and I am a scrap quilter. 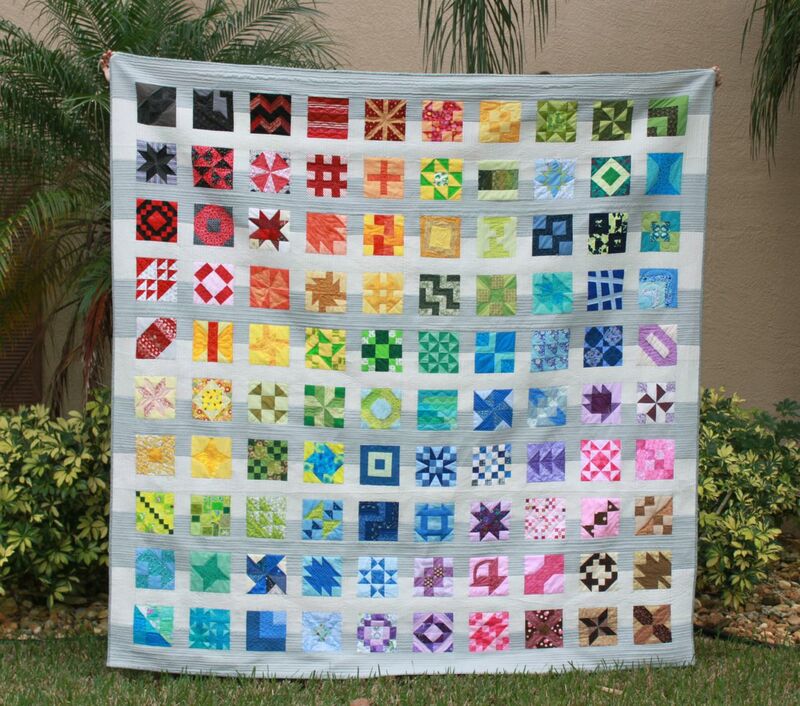 I've been a scrap quilter for as long as I can remember. 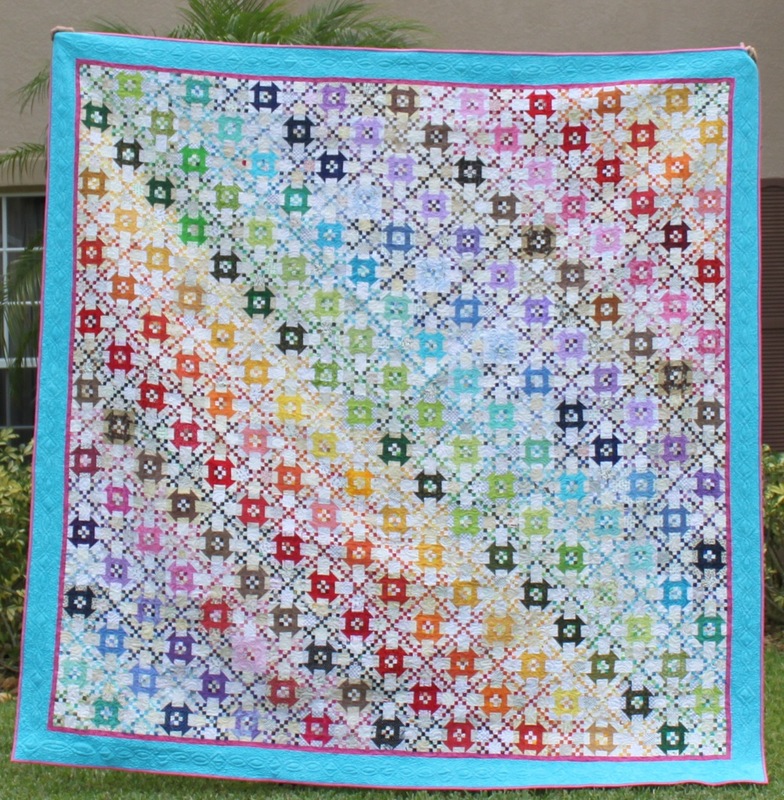 Almost every quilt that I make is scrappy. 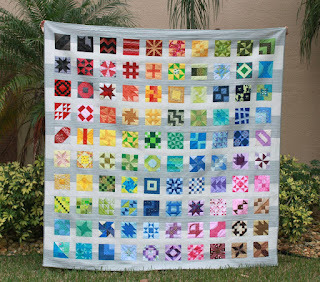 I'm not sure where all the scraps come from as I never seem to make non scrappy quilts. 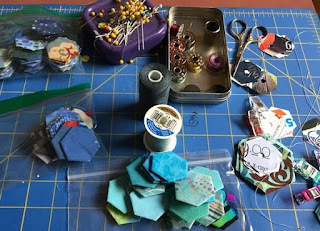 I keep working to use up all my scraps, and while I use them all up, I just seem to keep making more. 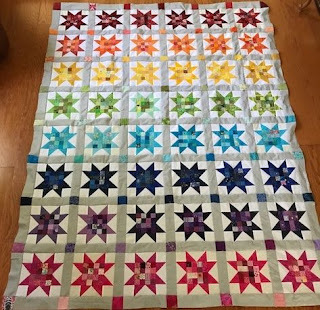 Trying to be more systematic about using up scraps, I decided to start the Rainbow Scrap Challenge several years ago. By choosing one color each month on which to focus, the goal was to encourage more people to use more scraps. 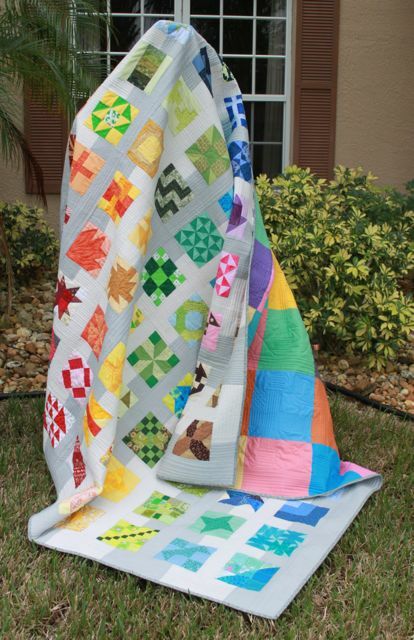 I usually have several quilts going at any one time. 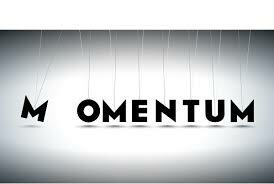 I love to work with simple units which can be reused in different ways. These 9 patches were made each month for several years of the RSC. One year I set them on point with framed black and white corners. On another year I framed the same blocks and alternated them with stars. Mai Tai Sunrise was the result. 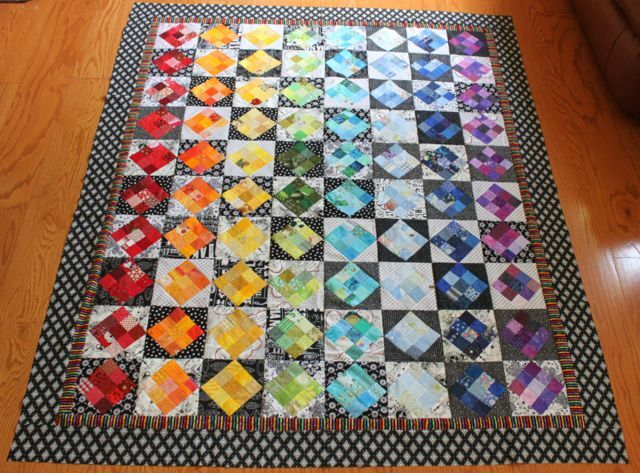 For the past several years, I have also designed blocks for a monthly quilt along. This one is my favorite so far. Different 6 inch blocks serve as the center for Sawtooth stars with alternating chain blocks. I really enjoy this one too. It is just random 6 inch blocks, but it was lots of fun working to come up with new blocks and tutorials each month. 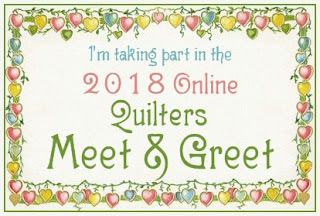 A special thanks to Benita for hosting this quilter's meet and greet. Be sure to visit her blog for more details. Hurray for three day weekends! It is already Sunday and I would usually be worried already about catching up on school work. Instead I spent the morning sewing this quilt top together. 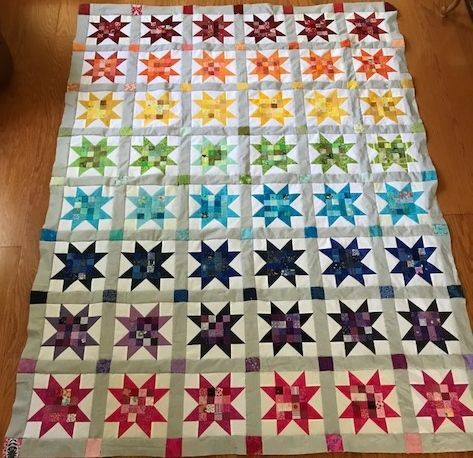 The postage stamp stars were put together over time as part of the rainbow scrap challenge. 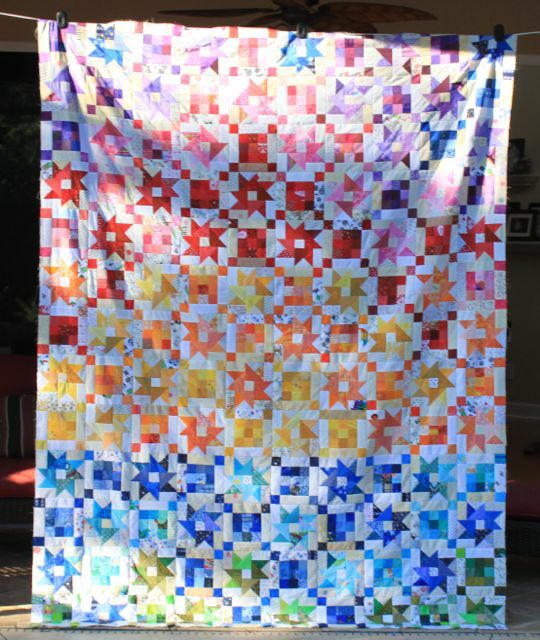 I have several quilts worth. 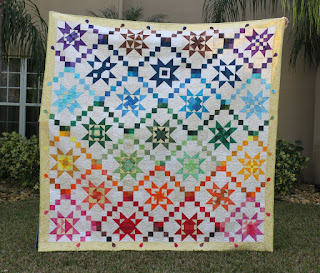 I think a nice wide border will finish this off and then some loop de loops for quilting. I'm blocked out of the sewing room for a bit as Kurt is trying to fix a window. It is supposed to move up and down on some sort of spring, and one day when I went to open it up, the spring just popped right out. He has his engineers problem solving face on right now as he is researching window repair options. While I wait for that to get all fixed up, I think that I will work on some maintenance of my own. My poor blog has been sadly neglected lately as the school year has steam rolled right over me. Just when you think all the balls are flying along in the air, one of them will drop and demand attention again. Somehow I haven't been getting any e-mail notifications on comments, and the tabs are all out of date. That will leave tomorrow open for school work. We had quite a time with textbooks last year due to funding cuts and my AP Biology class did not make the list. We made due with cast offs from dual enrollment as they get new books whenever they are available. So this summer I switched everything over and made support materials to go with the "new to us" books. Then last week I got notice that funding had become available and we will get new books after all. So now I'm back to the drawing board and need to shift again to get everything correlated with the newer books that should come in soon. Good news of course to be getting new books, just a bit more work to make it all line up. Hopefully a nice long holiday Monday will let me make a big dent. It is a new month, which means that it is time to put away your oranges and get out your dark blues and/or dark neutrals. 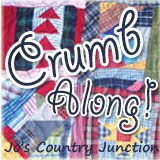 It also means that there is a new block for squared away. Just one more block to go.